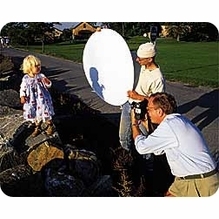 FlexFill manufactures the original collapsible reflector. This trusted system allows you total lighting control and adjustments without the added bulk and weight associated with traditional reflector systems. Whether you're shooting on location or in the studio, FlexFill reflectors are a smart addition to your gear. Each FlexFill reflector promises complete control of your lighting's contrast and quality, with both natural and artificial illumination, so you can expect high-quality control indoors and out. The best part is, reflectors collapse to one-third their working size for easy transport and compact storage. Permits complete control of lighting contrast and quality, with both natural and artificial illumination. Collapses to a package one-third its working size for easy transportation and compact storage. Sets up and collapses in much less time than rigid reflectors. All fabrics are carefully quality- controlled to ensure batch-to-batch consistency. BarnDoor Lighting has FlexFill reflectors in sizes ranging from 20 to 60 inches to suit your needs. All of these products are designed for fast, simple setup in much less time than your standard rigid reflectors. They're made in the U.S. with quality-controlled fabrics to ensure the best possible quality and performance. All FlexFill reflectors come with a zippered nylon pouch for storage and protection while not in use. In addition to reflectors, we also offer the right FlexFill holder to match your system. If you have any questions whatsoever, contact us today at 1-888-276-3667 or info@barndoorlighting.com.